As the creators of a live release that is considered to be one of the all-time great concert recordings in the realm of heavy metal (1979’s ‘Unleashed in the East’), whenever Judas Priest announce a new live album, metalheads worldwide instantly take note. And on ‘A Touch of Evil: Live’ (due for release in July 2009 via Sony Music and Epic Records), the mighty Priest - which includes singer Rob Halford, guitarists Glenn Tipton and KK Downing, bassist Ian Hill, and drummer Scott Travis - doesn’t disappoint. Focusing primarily on fan-revered album cuts (all previously unreleased in live form on CD), ‘A Touch of Evil: Live’ features absolutely scintillating renditions of such Priest gems as “Riding on the Wind,” “Beyond the Realms of Death,” “Dissident Aggressor,” “A Touch of Evil,” “Eat Me Alive,” and the set-closing “Painkiller.” Also of note are the first live album appearances of standouts from Priest’s critically acclaimed 2008 concept double disc, ‘Nostradamus’ (“Death” and “Prophecy”). 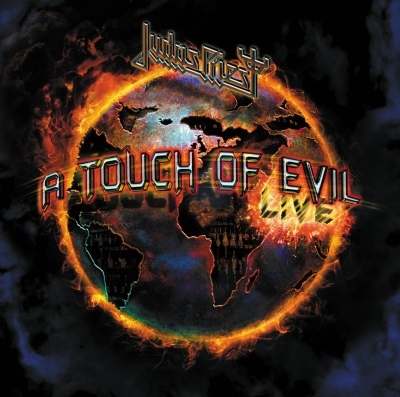 Recorded by Martin Walker and Brian Thorene during the Judas Priest’s mammoth 2005 and 2008 world tours, ‘A Touch of Evil: Live’ also marks the first Priest album that producer Tom Allom has worked on since 1988 (co-producing along with the band). It was such Allom-produced albums as the aforementioned ‘Unleashed in the East,’ as well as ‘British Steel’ and ‘Screaming for Vengeance’ (among others) that made Priest not only one of the premier metal acts, but one of the leading global rock acts. As heard throughout ‘A Touch of Evil: Live,’ Priest remain a must-see live act…and a must-hear one, as well.